This exotic shaped fruit is sweet in flavor and can be easily grown inside as a potted plant, and if confined to the size of a one gallon pot will not grow taller than about two feet. However, if it is planted outside it can grow up to three feet if fertilized heavily. 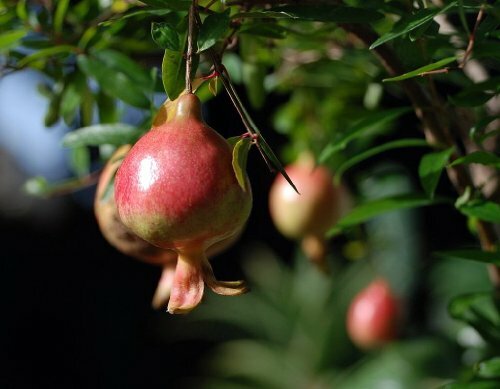 This unique shrub has a constant load of fruit or blooms and the fruit is sweeter if grown in full sun outdoors, but it is usually grown as a flashy ornamental. Florists greatly favor this plant because of its ease in drying for use in wreaths and as Christmas tree ornaments. As a bonsai tree it is grown for its brilliant orange-red trumpet-like flowers followed in fall by ornamental, small, spherical-like orange-red fruits. Has dark green leaves with shades of bronze. The plant you will receive can be grown as a house plant or trained as a bonsai!